Principal harpist at the UCLA Herb Alpert School of Music, Simone Salmon is a native of southern California. She is completing her Bachelor's degree with a double concentration in harp performance and music theory at UCLA. Simone has won a large number of music competitions and scholarships in California. She has performed with many members of the Los Angeles Philharmonic, including principal harpist Lou Anne Neill, violinist Barry Socher, violist John Hayhurt, associate prinicipal cellist Daniel Rothmuller, violinist Guido Lamell, and principal bassist Dennis Trembly. Simone performed with harpists Lou Anne Neill, Amy Schulman and Alex Rannie in Berlioz's Symphonie Fantastique. Simone has performed in orchestras conducted by Paul Chihara, Bright Sheng, Guido Lamell, and Neal Stulberg. She has performed numerous times at the Music Academy of the West. Simone's repertoire includes Celtic music, and plays Irish harp for various Irish dance academies in the Los Angeles area. 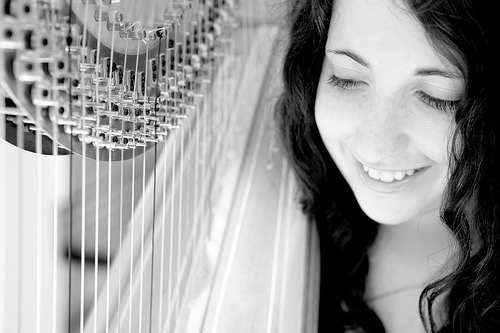 Simone performs regularly at UCLA as a studio musician for all harp compositions written by UCLA students. On weekends Simone Salmon teaches harp in her private studio in Los Angeles. She has also instructed UCLA composition students in writing for the harp, teaching alongside world-renowned composers Paul Chihara and Mark Carlson. Simone has privately instructed many composers in the Los Angeles area on writing for and playing the harp. Since she was nine years old, Simone Salmon has performed at a great many events in Santa Barbara, Thousand Oaks, Ventura and Los Angeles. She plays in many ensembles, big and small. Her most recent development is a trio of harp, cello, and violin that. She also plays in a harp, flute, and viola trio and many harp duets with harpist and former harp teacher, Rebekah Scogin. Simone Salmon plays as principal harpist in both the UCLA Philharmonia and UCLA Symphony, and while freelancing has played with many other orchestras in southern California. Once she earns her Bachelors degree Simone will work toward a masters of music in harp performance and eventually her doctorate in music theory.